When I was 26 a friend of mine showed me a film, John Ford’s The Grapes of Wrath, and it was a picture that really resonated throughout the rest of my life and I think… because Steinbeck’s novel and Ford’s picture ask a real basic question, and they ask a question about whether our salvation is individual or whether our faith, you know if we all rise and fall together in some fashion, if there’s such a thing as individual salvation or are we all connected. I think that’s the question that we sort of ask and answer by what we do and the way we behave on a daily basis. This beautiful scene at the end of the picture, Tom Joad has killed a security guard that has killed a friend of his and he knows he’s gonna have to leave his family, and they’ve come thousands of miles and they had nothing and… he’s gonna have to tell his mother that after all she has lost she’s gonna lose her son now. But before that scene there ‘s a… it’s a sort of a dance that happens in the working camp. And there’s something about the music and the faces that I always thought it was for holding out possibility of beauty in life and in the world even in a very brutal world. Where there’s beauty there’s hope, and where there’s hope there’s divine love or whatever you wanna call it. But after this dance Tom slips into his mother’s tent beneath, touches her very gently and he says: “Mama, I gotta go now”. They step out underneath these dark trees and she says: “Tommy, I knew this day would come, but how I might gonna know where you are and how you are, how I might gonna know if you’re alive, if you’re well”. And he says: “Well, all I know is that I’ve gotta go out, and I’ve got to kick around and I’ve got to see what’s wrong, and I’ve got to see if there’s something I can do about it to make it right. And you’ll see me mama, because at night when you’re sleeping I’ll be in that darkness that’s all around you, you’ll see me, and you’ll hear me in men’s voices when they’re yelling because they’re angry, you’ll hear me and you’ll see me in the way the kids sound when they’re coming in at night and they know that there’s food on the table and that they’re safe, you’ll see me”. Canzone conclusiva del consueto set dedicato alle canzoni “del confine”, in ogni concerto del tour acustico Across the Border e’ sempre stata preceduta da una lunga introduzione in cui Bruce parlava del film di John Ford “The Grapes of Wrath” indugiando nel racconto dell’intera scena finale dell’addio di Tom Joad alla madre. Le parole di Bruce oltre ad indicare ogni sera la chiave di lettura della canzone restano anche come invito rivolto al pubblico alla visione del film e alla lettura del romanzo di John Steinbeck dal quale il film e’ tratto. Guidati dal discorso introduttivo pronunciato da Bruce al teatro Smeraldo possiamo accogliere questo invito e vedere come prima Steinbeck nel romanzo poi Ford nel film costruiscano l’ episodio conclusivo. Bruce apre l’introduzione sottolineando come il film di Ford lo abbia letteralmente accompagnato nel corso di tutta la propria vita e subito dopo, quasi a motivare questa dichiarazione, spiega come sia nel film che nel libro si affronti la questione fondamentale della possibilità che esista una redenzione solo collettiva degli individui, tema sempre attuale secondo Bruce con il quale ciascuno può sempre misurarsi nella sfera del proprio agire quotidiano. Su questo motivo senza dubbio tanto Steinbeck che Ford tornano ripetutamente fino al dialogo finale tra Tom e la madre che in entrambi i casi ruota interamente attorno a questa idea. Siamo alla fine della storia, per vendicare il suo amico Casy Tom Joad ha ucciso il guardiano che lo aveva assassinato cosi’ ora per evitare di essere riconosciuto e messo in galera e’ costretto a fuggire. E’ interessante notare come tra il finale del film e quello del romanzo di Steinbeck, pur nella sostanziale coincidenza del percorso ideologico, la scelta e il montaggio delle scene differisca notevolmente. Nel romanzo Tom trova rifugio vicino ad un acquedotto abbandonato con l’accordo che qualcuno della famiglia venga di nascosto a portargli del cibo, ma quando dopo qualche tempo la sicurezza di questo nascondiglio sembra essere in pericolo e’ la madre stessa che va ad avvisarlo della necessita’ di una sua fuga immediata. La scena dell’addio avviene quindi nell’oscurita’ totale in questa tana che Tom si e’ costruito tra i cespugli. Tom parla alla madre di Casy ricordando la sua idea dell’anima individuale come semplice parte di una immensa anima collettiva ed esprime il desiderio di proseguire sulla strada indicata dall’amico. Nel libro inoltre non c’e traccia del monologo di Tom che Bruce recita in chiusura del suo racconto. Per questa parte del monologo, grande fonte di ispirazione per Bruce che ancora lo cita nella strofa finale di The Ghost of Tom Joad cosi’ come per Woody Guthrie autore prima di lui di una trasposizione della vicenda in chiave musicale, bisognera’ quindi fare riferimento unicamente al film di John Ford. Dopo la scomparsa di scena di Tom nel libro ci sono ancora un paio di capitoli in cui si narra di una dura giornata di lavoro della famiglia Joad nei campi di cotone, del parto prematuro di Rosasharn, sorella di Tom, e del grande diluvio che spazza via le poche cose dei profughi. Il romanzo si chiude con la scena simbolica dell’allattamento del vecchio: Rosasharn, il cui bambino e’ nato morto, con una atto di grande solidarieta’ nutre al proprio seno un vecchio ormai stremato offrendo cosi’ a lui e idealmente a tutta la comunità una nuova speranza di vita. Ma: All right, Tommy, but what do ya figur you’re gonna do? Tom: You know what I’ve been thinkin’ about? About Casy, about what he said, about what he done, about how he died. I remember all of it. Ma: He was a good man. Ma: Oh, Tommy. They’d drag you out and cut ya down just like they done to Casy. Ma: Tommy, you’re not aimin’ to kill nobody? Tom: No, Ma, not that. It’s just, well, as long as I’m an outlaw anyways, maybe I can do somethin’. Maybe I can just find out somethin’, just scrounge around and maybe find out what it is that’s wrong and see if ain’t somethin’ can be done about it. I ain’t thought it all out clear in my mind, I can’t. I don’t know enough. Ma: How am I gonna know about ya, Tommy? Why, they could kill ya and I’d never know. They could hurt ya. How am I gonna know? Tom: Well, maybe it’s like Casy says. A fella ain’t got a soul of his own, just a little piece of a big soul – the one big soul that belongs to ever’body. Then…then, it don’t matter. I’ll be all around in the dark. I’ll be ever’-where – wherever you can look. Wherever there’s a fight so hungry people can eat, I’ll be there. Wherever there’s a cop beatin’ up a guy, I’ll be there. I’ll be in the way guys yell when they’re mad – I’ll be in the way kids laugh when they’re hungry an’ they know supper’s ready. An’ when the people are eatin’ the stuff they raise, and livin’ in the houses they build – I’ll be there, too. Le parole di Tom Joad, esaltate sullo schermo dalla splendida recitazione di Henry Fonda, come abbiamo gia’ notato trovano terreno fertile nella immaginazione creativa di Woody Guthrie che in Tom Joad cosi’ sintetizza il messaggio del monologo: “Wherever little children are hungry and cry / Wherever people ain’t free / Wherever men are fightin’ for their rights / That’s where I’m gonna be, Ma / That’s where I’m a gonna be”. In perfetta sintonia tanto con il modello cinematografico di John Ford che con quello musicale di Woody Guthrie, cosi’ Bruce in The Ghost of Tom Joad: “Wherever there’s a cop beatin’ a guy / Wherever a hungry newborn baby cries / Where there’s a fight against the blood and hatred in the air / Look for me Mom I’ll be there / Wherever there’s somebody fighting for a place to stand / Or decent job or a helpin’ hand / Wherever somebody’s struggling to be free / Look in their eyes Mom you’ll see me”. Subito dopo nel film la madre di Tom gli dice di non riuscire a comprendere le sue parole, cosi’ il figlio per consolarla ma con sincerità le rivela come anche per lui tutto questo per ora sia solo una intuizione non ben definita difficile da afferrare (“Me neither, Ma, but just somethin’ I’ve been thinkin’ about”). Un istante prima che Tom se ne vada per sempre come ultimo saluto la madre gli dice: “Tom, we – we ain’t the kissin’ kind, but…” e senza esitazione lo abbraccia e lo bacia. Sulle note di “Red River Valley” il campo dell’inquadratura si allarga e Tom va via velocemente senza più voltarsi indietro fino a diventare una piccola figura in lontananza che si staglia sul cielo mattutino. Cosi’ si chiude il film nell’edizione italiana, tuttavia altre fonti suggeriscono che questa immagine non sia quella veramente conclusiva. In diverse occasioni Bruce giunto alla fine del monologo proseguiva l’introduzione di Across the Border facendo riferimento ad un’ altra scena del film successiva a quella della partenza di Tom: “He disappears out into the night. Next morning Joads are heading North for work and father says: ‘ What we’re gonna do without Tommy?’ and mother says: ‘We’re gonna keep goin’ “ (Freehold 8 novembre ’96, St. Rose of Lima School). Ma: Scared, ha! I ain’t never gonna be scared no more. I was though, for a while it looked as though we was beat, good and beat. Looked like we didn’t have nobody in the whole wide world but enemies. Like nobody was friendly no more. Made me feel kind of bad, and scared too. Like we was lost and nobody cared. Pa: You’re the one that keeps us goin’, Ma. I ain’t no good no more, and I know it. Seems like I spend all my time these days thinkin’ how it used to be. Thinkin’ of home. I ain’t never gonna see it no more. Ma: Well, Pa. A woman can change better’n a man. A man lives, sorta, well, in jerks. Baby’s born and somebody dies, and that’s a jerk. He gets a farm or loses it, and that’s a jerk. With a woman, it’s all in one flow like a stream. Little eddies and waterfalls, but the river it goes right on. A woman looks at it that way. Pa: Well, maybe, but we sure taken a beatin’. Ma: I know. That’s what makes us tough. Rich fellas come up an’ they die an’ their kids ain’t no good, an’ they die out. But we keep a-comin’. We’re the people that live. They can’t wipe us out. They can’t lick us. And we’ll go on forever, Pa… ‘cause… we’re the people. Nonostante tutto quello che hanno dovuto soffrire e le difficoltà che ancora dovranno sopportare la madre di Tom manifesta la propria fiducia nel destino dei suoi cari e in quello di tutte le persone come loro delle quali, e’ convinta, la società non potrà mai fare a meno. Il film si chiude quindi con questo messaggio di speranza di Ma Joad la quale, confrontatasi con la realtà del crollo dei vecchi valori, ha acquisito ora la certezza dell’esistenza di una nuova e più profonda solidarietà tra “la gente” in virtù della quale sarà per tutti loro possibile ottenere qualcosa di meglio dalla vita. L’ultima immagine del film che si trova descritta nella sceneggiatura è quella dei veicoli degli emigranti che in fila si spostano ora verso Fresno, nuova terra promessa verso la quale ci si dirige nella certezza di trovarvi del lavoro. L’immagine illumina le parole con le quali Bruce al teatro Smeraldo dopo avere dato vita ancora una volta al personaggio di Tom Joad conclude l’introduzione ad Across the Border: “So this is a song about how people keep goin’, about the importance of faith, of hope and belief in love”. La storia narrata in Across the Border viene quindi presentata al pubblico come un’altra raffigurazione della forza straordinaria e misteriosa che spinge gli individui ad andare avanti. La speranza e la fiducia nell’amore infatti accompagnano il protagonista della canzone di Bruce e rendono credibile il suo progetto di una nuova idilliaca esistenza con l’amata al suo fianco: “For you I’ll build a house / High upon a grassy hill / Somewhere across the border / Where pain and memory / Pain and memory have been stilled / There across the border”. L’atmosfera di speranza e rinascita creata nel finale del romanzo di Steinbeck dalla bellissima scena dell’allattamento del vecchio e in quello del film dalle parole della madre di Tom aleggia anche nella canzone che insieme a Galveston Bay rappresenta uno dei pochi momenti di The Ghost of Tom Joad in cui una via d’uscita sembra essere ancora accessibile. Un’ invocazione ricca di reminescenze bibliche chiude Across the Border: “For what are we / Without hope in our hearts / That someday we’ll drink from God’s blessed waters / And eat the fruit from the vine / I know love and fortune will be mine / Somewhere across the border”. 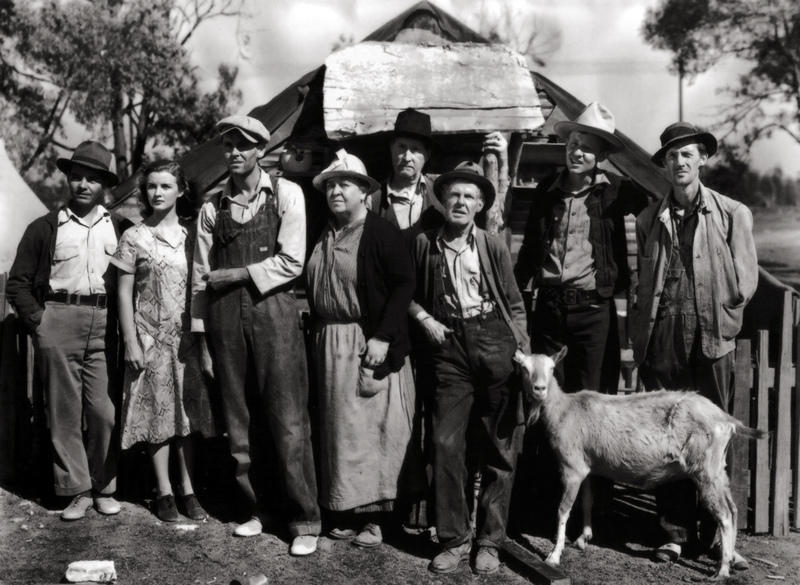 Il sogno del protagonista può essere condannato a restare tale cosi’ come il futuro della famiglia Joad può essere quello di un’esistenza ancora di dolore e miseria, ma una nuova consapevolezza e’ stata acquisita dalla quale sara’ comunque possibile ricavare la forza per andare avanti, giorno dopo giorno.